Crafting...: Fussy Fairytales ~ sashing, check! Fussy Fairytales ~ sashing, check! The sashing for joining the blocks of the Fussy Fairytales quilt is finished, and actually wasn't as tedious as I thought it would be. I used a lot of pins, which makes it take longer but in the end I think I achieved more accurate results than I sometimes do with sashing. 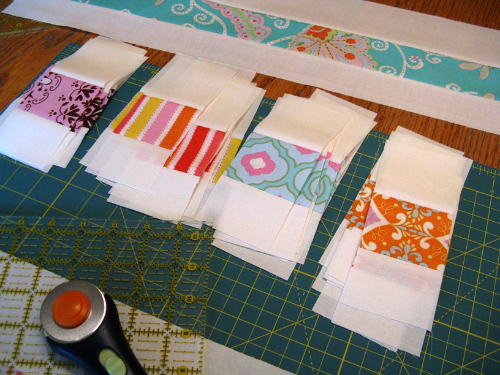 Next comes the "floating blocks" border, which is in progress.....an easy strip piecing method, which makes things so much quicker! And exciting news, I had my first Etsy sale this weekend! And a quilt no less. :) My Cuzco baby quilt has sold to someone who is planning to use it for their new baby girl. I am SO excited!! Thanks to everyone who has been so encouraging in this little venture of mine. Congrats on the sale!! YAY! Your first sale!! Woo hoo!Your Fussy Fairytales looks amazing Heather! Hope you are all safe and secure tonight on the island. I have 2 brothers in Vancouver and it always makes me nervous to hear earth quake news! Great job on the Sashing and the sale! 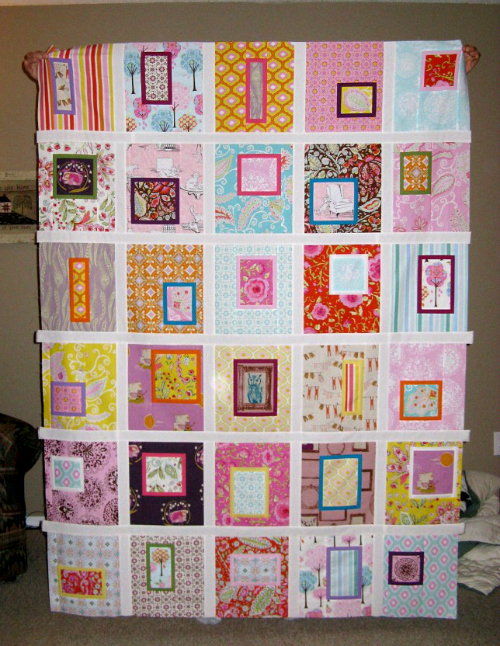 oh this quilt is really fun - glad you survived the sashing so easily! And congrats on your first sale - awesome! Congrats on selling your first quilt! Now you can make another one to replace it! I am a real pinner when it comes to putting things together - so annoying to do and when sewing - but so worth it in the end in terms of result! These are so beautiful. Congratulations on your sale! Congrats on the sale - such a beautiful quilt! And I love your Fussy Fairytales top too. Well done on the sale! I love the quilt, it looks beautiful and the sashing looks incredibly perfect!